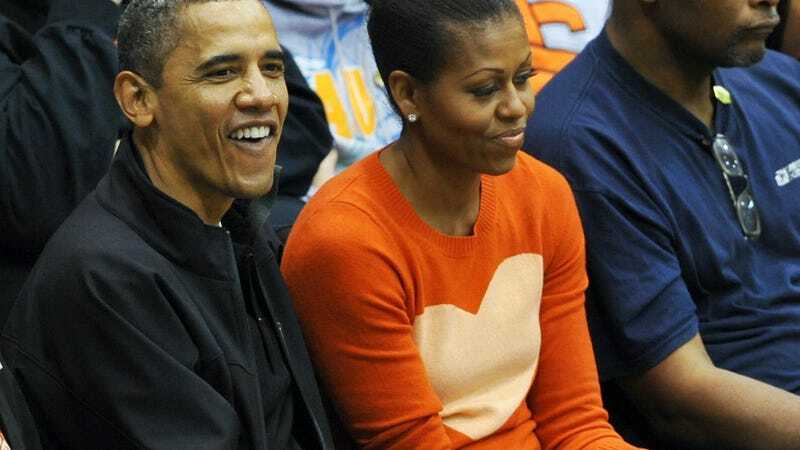 Then-President Barack Obama and first lady Michelle Obama watch a basketball game in Towson, Md., on Nov. 26, 2011. “It’s a jacket,” Melania Trump’s spokesperson said when the first lady chose to wear a Zara jacket bearing the words, “I really don’t care, do U?” last week. But as former forever first lady Michelle Obama’s former stylist Meredith Koop reminded us last weekend, first ladies never make unconscious fashion statements. But amid the outcry that arose from Melania Trump’s unapologetic insensitivity, perhaps the best responses have been in the form of the “clapback fashion” created by several designers and DIYers. One standout? Female-founded brand Wildfang, which created a capsule collection of clothing ($40-$98) that reads, “I really care, don’t U?” with 100 percent of proceeds immediately going to immigrant-advocacy agency Raices. New “public service apparel” brand PSA Supply Co. (created by global citizen sites Upworthy and GOOD) also got into the act, creating a $29 T-shirt that benefits youth-led immigrant network United We Dream (we’re also big fans of its “Nov. 6” tee). And of course, there’s always the DIY option. Several folks used their own resources to rebuke Trump’s fashion statement, including this adorable little girl and musician Michael Franti. But of course (because we have expensive tastes), our reluctant favorite came in the form of a hand-embroidered $380 cashmere sweater from luxury resistance label (oxymoronic, and we know it) Lingua Franca. To be fair, the brand will donate $100 of the retail price of each sustainably sourced, fair trade cashmere sweater to the charity of your choice, but in the end, we just love the idea of saying it with our chests—you know, like a (first) lady should.